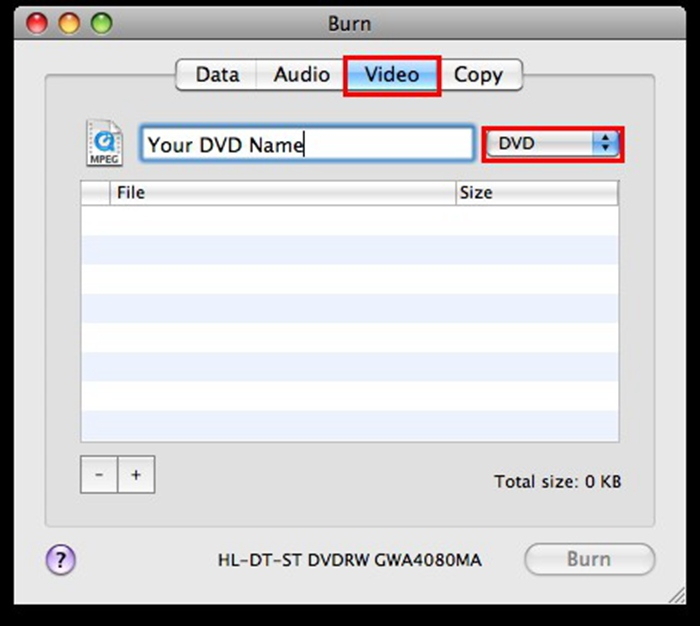 Burn video to DVD/ISO/DVD Folder/Blu-ray DVD on Mac. Edit videos before video to DVD conversion. Customize DVD template for DVD conversion. 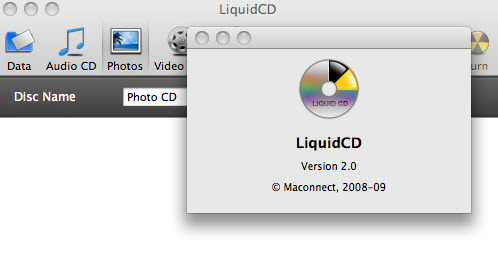 There are a number of DVD creator for Mac available with the different set of features and functions. Among the myriad of options, it is hard to decide one. To help you choose one, we have listed top 12 DVD burning software for Mac. Review the features, pros, and cons of these programs and decide. 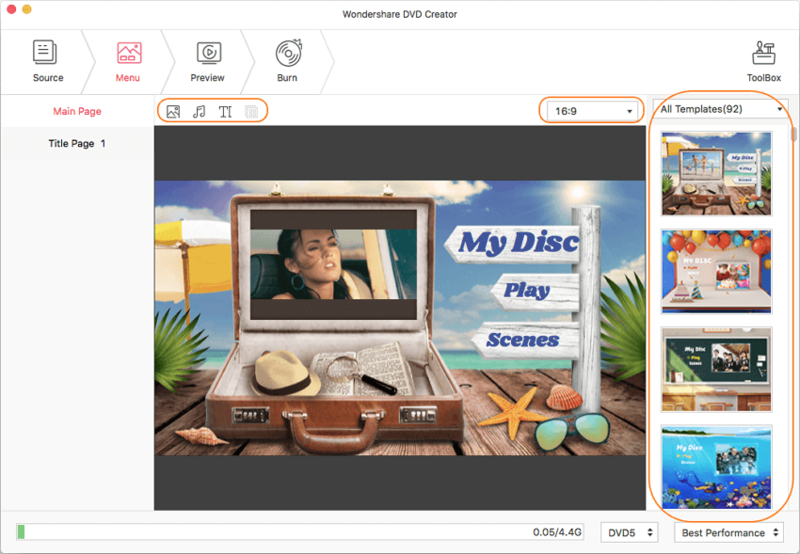 Wondershare DVD Creator is the best DVD burning software for Mac that burns all types of videos, audio, and picture files to DVD in an effortless manner. It has good customer support service so you never need to worry about the after-sale problem. This all-in-one software can not only help you burn files to DVD easily and quickly, but also has additional functions such as Video Editor, Slideshow Maker, Burn Data Disc, ISO to DVD, One-click to Burn DVD/Blu-ray disc, and more. Burn video/image files in any format to DVD/Blu-ray Disc on Mac latest OS with no quality loss. 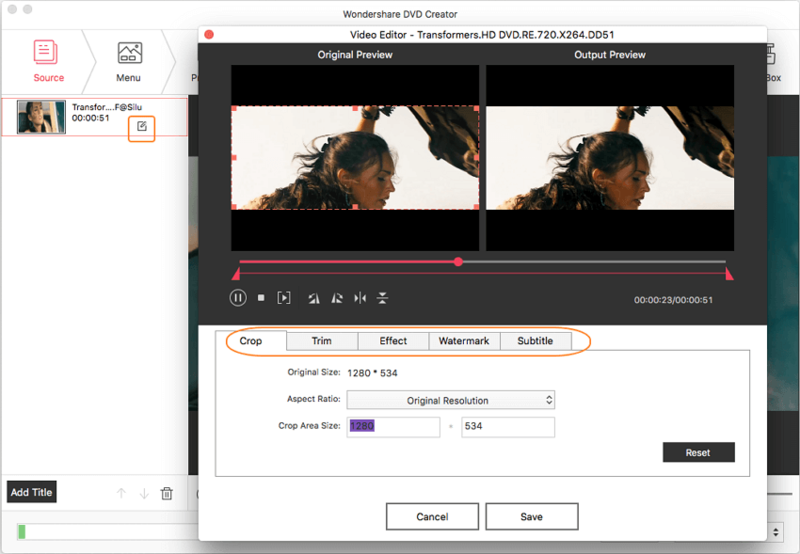 Built-in video editor to edit videos with Crop/Tirm/Rotate/Watermark/Subtitle/Effects. Offer 100+ free menu templates from Travel, Memory, to Family Life theme. Customize DVD menu templates with background picture, music, text, and others. Burning videos and images to DVD with real-time preview and super fast burning speed. Toolbox with functions of Slideshow Maker, Video Editor, One-click to Burn DVD/Blu-ray disc, Data Disc, ISO to DVD, etc. Another top-rated DVD maker for Mac is Wondershare Video Converter Ultimate for Mac. The software supports all popular formats and file types for DVD and Blu-ray disc burning. If needed, the files can also be burned to DVD folder or ISO image files. The free DVD menu templates come with different themes and can also be customized by changing the font, size, and color of the DVD title. Background image or music can also be added to the templates if needed. 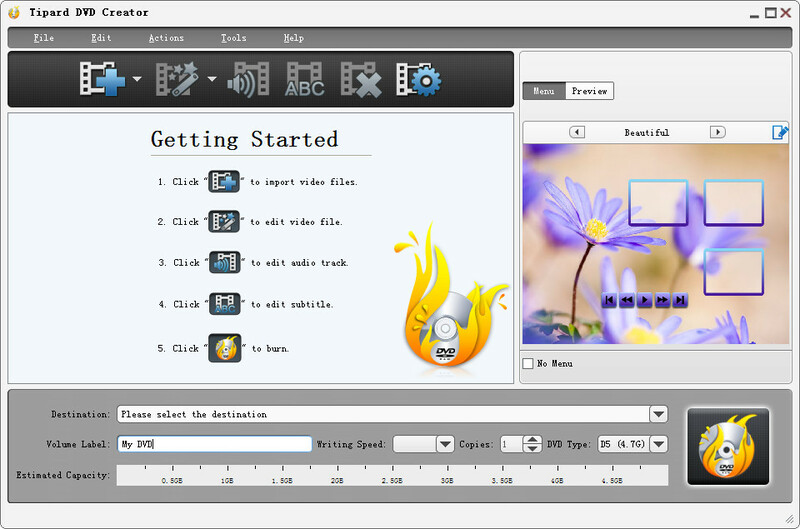 To personalize the videos before burning, the software comes with an inbuilt editor with functions like trimming, cropping, cutting, adding watermark, adding special effects, and others. Using the software you can burn multiple discs in no time and of high-quality. Wondershare Video Converter Ultimate being a complete video-toolbox also supports an array of other functions besides DVD burning like video conversion between 1000 formats, video download from more than 10,000 sites, media files transfer, and others. Allows burning files to DVD disc, DVD folder, ISO image files and Blu-ray disc. Free DVD menu templates to choose from. In addition to DVD burning, it allows video conversion, transfer, and download. Does not allow creating chapters. Supported OS: Mac OS X 10.14 (Mojave), 10.13, 10.12, 10.11, 10.10, 10.9, 10.8, 10.7, 10.6, and Windows. This is another DVD authoring software Mac that comes with decent DVD burning features. Using the software you can burn a range of video formats including MP4, DAT, 3GP, VOB, AVI, MKV, M4V, MPEG, and others to DVD. Additionally, you can also burn home movies, or downloaded videos from YouTube and other sites to disc using the program. Using the built-in editor of the software, you can rotate, flip, trim, add watermark, or enhance video before burning. You can also add subtitles to the video and personalize them by changing the color, size, and font. Audio tracks can be added to the video to add to the overall appeal. There are free DVD menu templates available to match the theme of your videos. Photo slideshows with music can also be created and gifted to someone special. Free DVD templates to match disc theme. Video Editor for personalizing videos before burning. Only supports DVD burning function. Limited DVD menu customization options. Supported OS: Mac OS X 10.10, 10.9, 10.8, 10.7, 10.6. 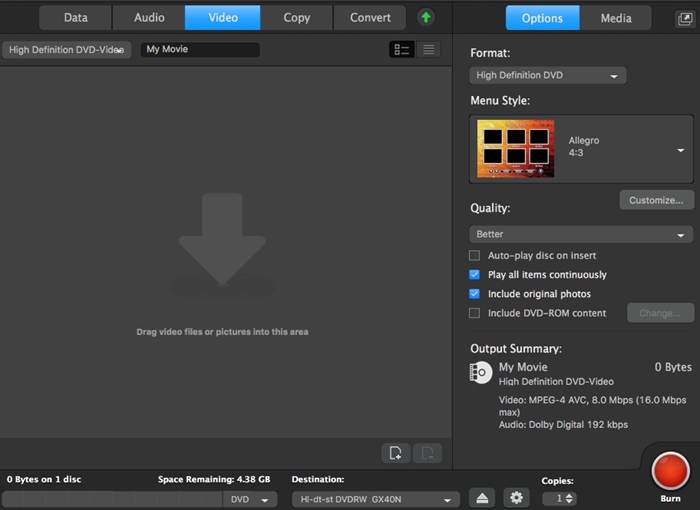 Burn is another popularly used DVD creator for Mac that is simple to use yet powerful. Almost all types of files are supported by the program for DVD and CD burning. You can create interactive menu while burning your movies to a disc or can also choose a theme. There is an option to select different filesystems for sharing the files with users having different OS. The program allows changing advanced settings like disc icon file permission, file dates, and others. Using Burn you can copy your discs or can also use the image files to recreate them into a DVD. File conversion is also supported by the software. A free and open source program. Supports all popular formats for DVD burning. Limited options for DVD templates. Lack DVD template customization options. Supported OS: Mac OS X 10.14, 10.13, 10.12, 10.11, 10.10, 10.9, 10.8, 10.7, 10.6, and lower. 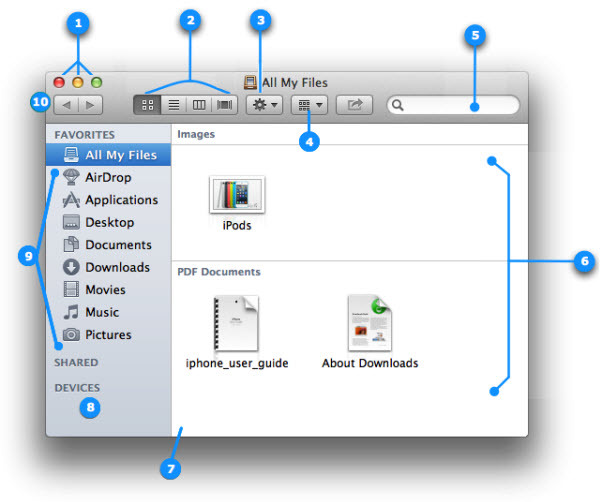 Finder is the default file manager of the Mac OS that also works as a free DVD burner for Mac. Using Finder, you simply need to insert the disc into the SuperDrive and select Open Finder from the pop-up screen. Next, open the disc window and drag the files that you want to burn. Click Burn button to start burning the added files. Finder works as a basic DVD burning software without any additional function or feature. Simple process and need no third party software. Very basic DVD burning function without any option for DVD template or customization. No editing or other features supported. Supported OS: Mac OS X 10.6, 10.5, 10.4.3. 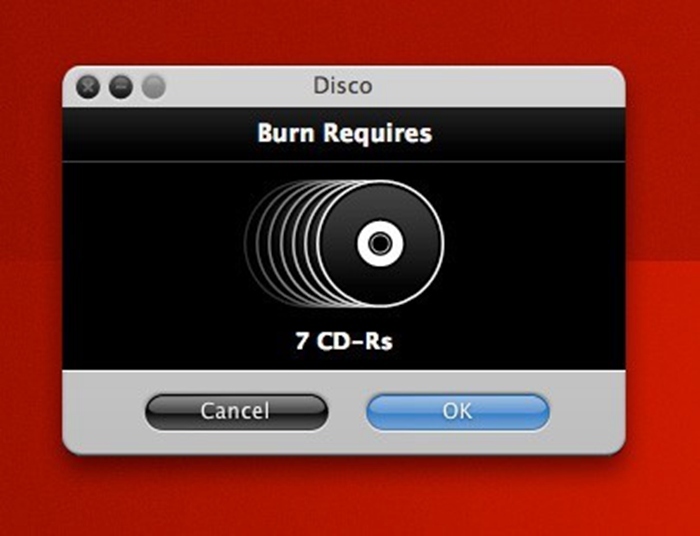 Disco is free DVD burning software for Mac with an informative and animated interface. The software supports burning a number of file types and formats to CD and DVD. You can also create disc images from your files for future disc burning. The program keeps a track of the files that are burned on a disc. You can also find out information like when the file was burned, edited, which disc it was burned and others. With Spanning feature of the program, a large size file is divided into multiple discs. Additional features include support for dual layer DVDs, audio burning, CD multisession support, and others. Officially, the development and the support of Disco has been discontinued since July 2011, but the software is available for download and use. Free to use software with an informative and animated interface. Discography feature to keep track of the burned files. Spanning feature to burn large file into multiple discs. No support for video editing. No option for DVD template of customization. Simply Burns is a Mac application that allows users to burn media files to CD and DVD. This open source software features GUI which is simple and easy to understand without any need for technical know-how. Popular video and image files can be burned to decent quality disc using the program. There are audio and data project, duplication mode, burn image mode and disc ripping mode. The software allows saving the project on the hard disks by treating them as documents. More than one project can be created or edited. Supports an array of disc burning activities. Allows to save the projects on hard disc. No multi-session support for all the file systems. No support to features like DVD template, customization, and others. Supported OS: Mac OS X 10.13, 10.12, 10.11, 10.10, and Windows. 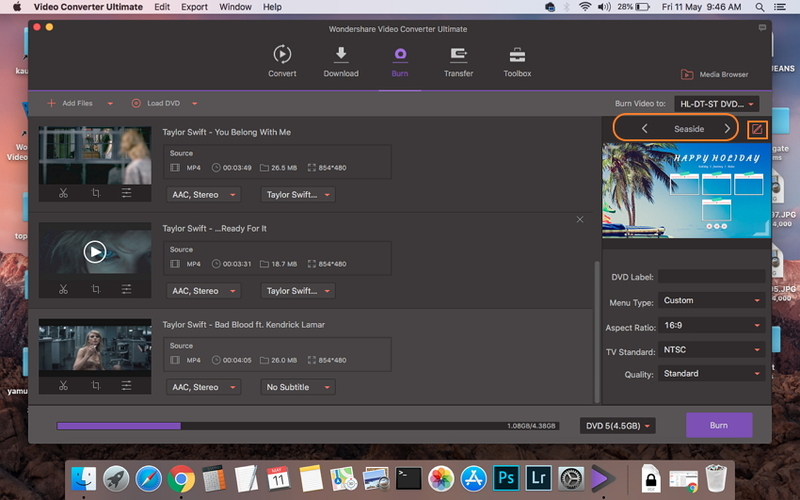 This free DVD creator Mac is a cross-platform application that allows users to create professional-looking DVDs in an effortless manner. This is an Open Source Software that is distributed under the GNU General Public License. You can create and burn DVD videos with the interactive menu using the program. There is also an option to design your own DVD menu or select from the available designs. A photo slideshow can also be created using the software. To add to the overall appearance of the disc, the software allows adding multiple subtitles and audio tracks. DVD Styler supports an array of formats including AVI, MOV, WMV, MPEG-2, DivX, MP2, MP3, and others. The MPEG and VOB files can be used without re-encoding. DVD menu customization options are also available. Open Source free to use software. Allows selecting from the available templates or create your own menu. DVD menu customization options available. Limited file support as compared to other professional tools. Comes with ad support that offers to install a toolbar during the process of software installation. This is another decent DVD burning software for Mac that is simple to use and allows burning videos and photos to a DVD. It is a free to use program that also supports burning audio and music files to CD. There is also an option to burn Dreamcast CDs which you can do after the option of Burn multi-sessions is unchecked. 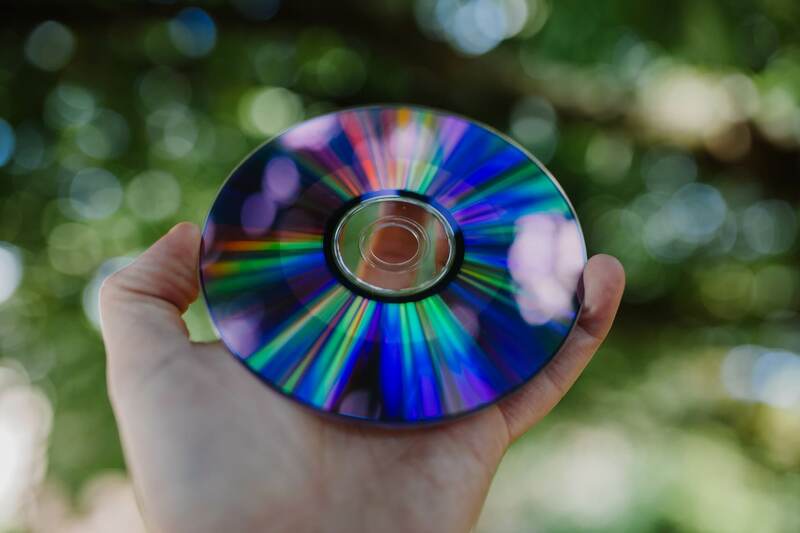 There are 3 main options in the software CD burning, DVD burning, and photos. If needed, ISO image files can also be created. Supports an array of file formats. Users have reported bugs in the software. This DVD Maker for Mac allows burning audio, video, and data files to CDs, DVDs, and Blu-ray discs in a quick manner. This is paid software that comes with a free version that allows only CD burning. A number of video file formats is supported for disc burning including VOB, MP4, AVI, MPG, OGM, and others. The software allows creating as well as managing chapters on DVD and Blu-ray discs. There are template menus for DVD authoring. You can record your videos to PAL or NTSC standards and also select from widescreen or standard formats. While burning an audio CD, quality of the file is maintained and there is also option to customize and pause between the tracks. In addition to the disc, files can also be burned to ISO image files. Support multiple file types and formats. Allows creating and managing disc chapters. No option to remove copy protection from commercial discs. Supported OS: Mac OS X 10.13, 10.12, 10.11, 10.10. This DVD authoring software Mac is a feature packed program that allows burning CDs and DVDs from music, data or video files. There are themed templates available that allow you to customize your disc. There is an option to copy the disc and also recover the files from the discs that are damaged. 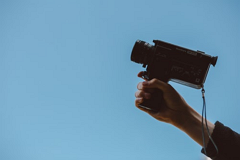 In addition to DVD burning, the software facilitates recording or capturing the video as well as audio from old tapes, camcorders, or from the internet. The MultiCam Capture feature allows recording multiple devices at a time. The editing tools and filters further aid in video and audio personalization. Video conversion and sharing is also supported. Allows to create complete DVD with titles, menus, and chapters. Supports video capture, conversion, and sharing. Limited file format support as compared to other programs. This is a decent DVD burn application for Mac that facilitates creating personalized DVD disc, DVD folder, and ISO files. The software supports commonly used formats like MP4, MOV, FLV, AVI, and others for disc burning in decent quality. In addition to local files, the home movies and downloaded files can also be burned. There are a number of free DVD templates like festival, city, animal, and others available to select the one that best matches the theme. Features to trim, crop, watermark video, and other editing functions are also there to personalize videos before burning. Additional features include DVD previewing, adding an audio track, background image, and adding subtitles. Easy to use software with support to all file formats. Option for DVD menu templates and customization. 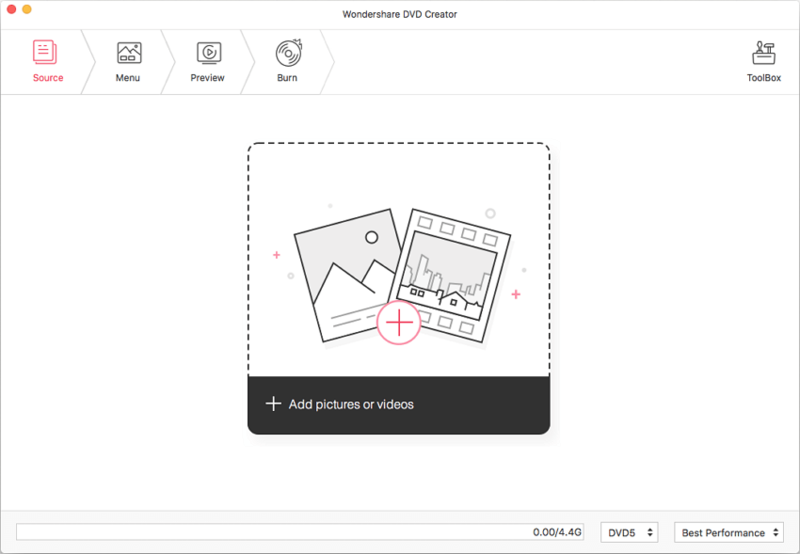 Considering the speed, quality, and others DVD features, Wondershare DVD Creator for Mac can be considered as the best DVD burning software for Mac. The intuitive and simple interface of the program allows creating professional-looking DVDs with simple steps. 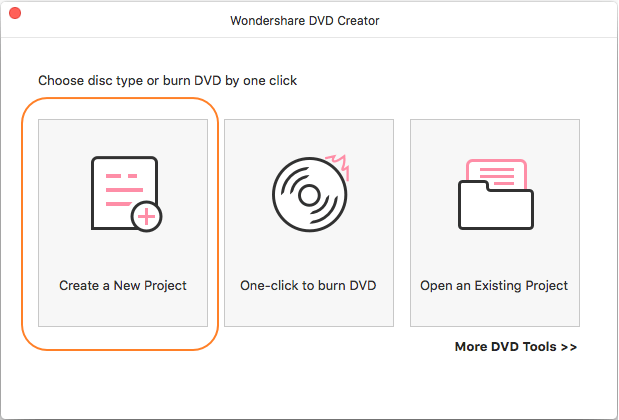 Open Wondershare DVD Creator software on your Mac OS 10.14 Mojave or other OS. From the window that appears like below, select Create a New Project option. Click the + sign to browse and add files from your PC. Multiple files can be added here. Alternatively, you can also drag and drop the file to the interface. Click the pencil-like icon on the video thumbnail to open Video Editor window and personalize it. It supported video crop, trim, add effects or subtitles, and edit watermarks. To view and choose from available DVD menu templates, click the Menu tab. A list of dynamic and static templates will appear on the right column of the interface. To customize the templates by creating chapters, setting aspect ratio, adding background music or images and other features, click the related icons at the top of the interface. Move to the Preview tab to check the created disc. Any changes if needed can be done. Next, click the Burn tab and insert a blank disc into your Mac. 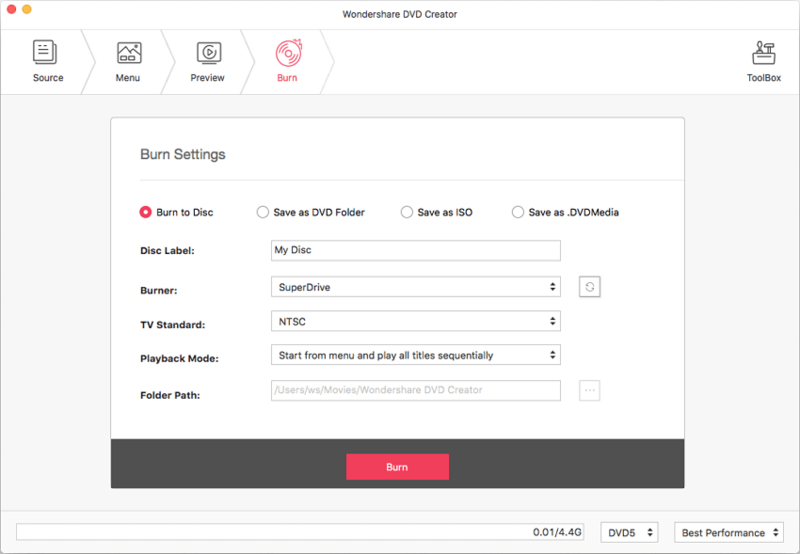 Select Burn to Disc option, and give a disc label, select burner, TV standard and other settings from the interface, click Burn button to burn your videos to DVD. You can also save videos as ISO files or DVD Folder with the best Mac DVD burning tool. So install Wondershare DVD burning software for Mac and enjoy burning DVDs and Blu-ray discs of high quality in no time. The free trial version of the software is also available.